Hot on the heels of the news that the 2nd round PCRA/BRA meeting on 15th. April is cancelled now more bad news that the round 3 meeting scheduled for the 8th. July is also cancelled. Massive delays to construction of the new track section and Pit area due to the very wet summer we've had is to blame. Next meeting will be Wakefield Park on the 15th (now round 2) and the 16th of September for the annual one hour event..
Again was judged a huge success as race goers showed plenty of interest in and sought information on Bucket Racing the fastest growing and most economical way into Road Racing. Bikes for all bucket classes were on display. In particular a huge amount of interest was shown by younger riders in the Commuterlite class which looks like continuing to grow at a rapid rate. 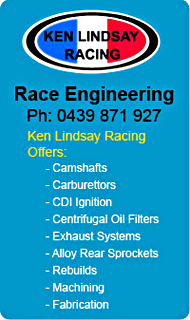 are up in the PCRA website for your perusal. Also a complete list of the prize winners. Click Here to Download the Awards PDF. See what makes BRA racers tick. Check out the brave souls who bared all to be first on our websites new segment. If you want your profile on the website email me: ozbucket Webmaster, and I will forward you a form. 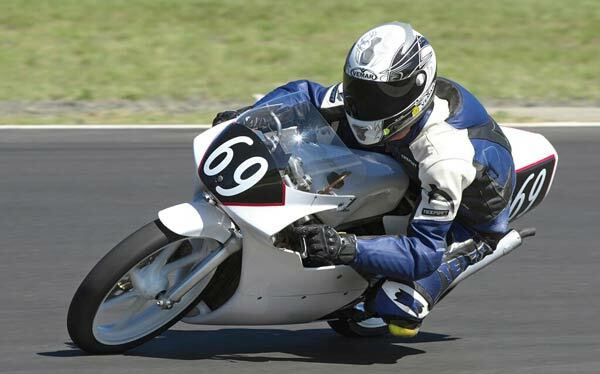 Bucket racing Association riders did very well across the classes at the 2012 Barry Sheene Festival of Speed meeting at Eastern Creek. 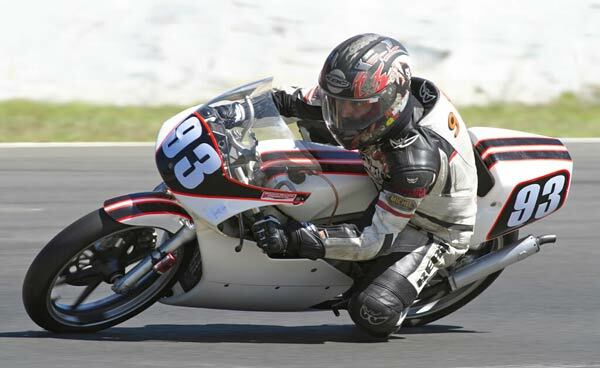 Lindsay McKay won all four heats to take out the Post Classic 250cc class, was 2nd in the Post Classic 350cc class and 3rd place in the Ken Lucas Senior Challenge. 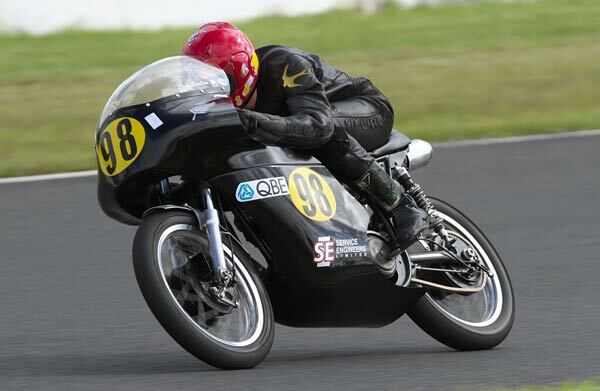 All results came from Lindsay's 250cc Yamaha which was ably looked after by Lyall Bennett. 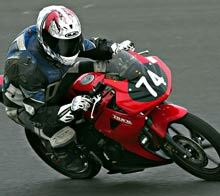 Stephen Kairl won the Forgotten Era 125cc class winning all 4 heats on his Honda MTR 125cc. 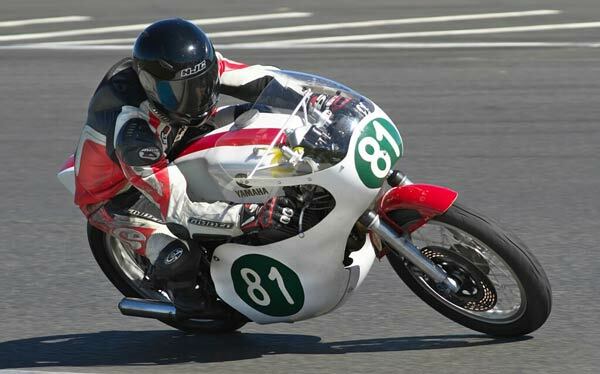 He was not so lucky with his 350 after finishing a fine third in the first leg of the Forgotten Era 350cc class, in the second heat he had a major sideways moment on his Yamaha when it seized in the high speed turn one. The Yamaha was parked with a suspected broken crank. 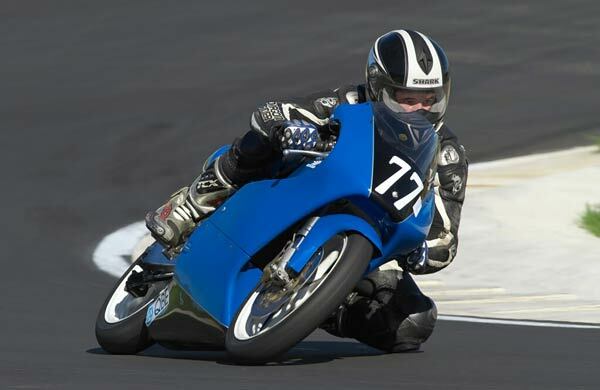 Jason Dunn and Paul Borg carried their fierce rivalry in Motolites to their P6 HONDA RS125's putting on some great racing swapping places continuously with Jason just edging out Paul for the weekend. 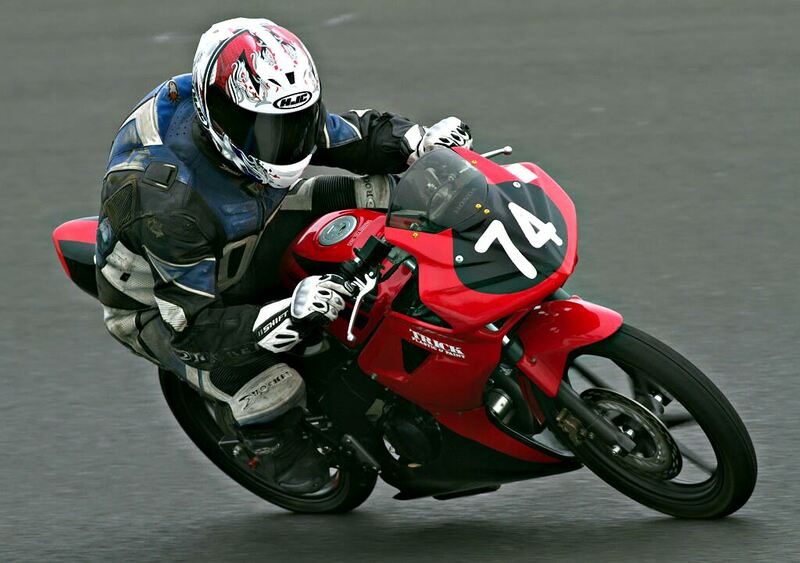 Jason was also competing in the period 6 250cc class but got taken out by another rider in the first heat. Riders OK but some hasty repairs by his Dad Col got the bike shipshape for the rest of the event. Jason concentrated on the 125cc class after that. Try as he might Paul Borg had to give best to Jason Dunn on the day but not without a fine display of close racing. 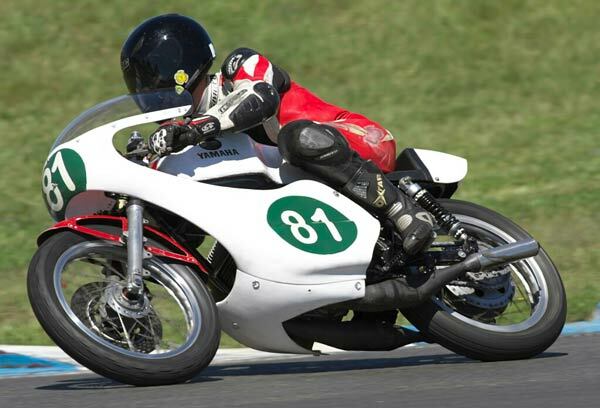 No mistaking the style, regular Motolite rider Tyler Bradford finished 2nd in the Pre modern F3 class on his Honda RS125 with Michael McLean (Whites racing products) another bucket racer finishing 3rd in the same F3 class on his Honda 400. Lindsay McKay on his winning way. The Yamaha ran faultlessly all weekend. 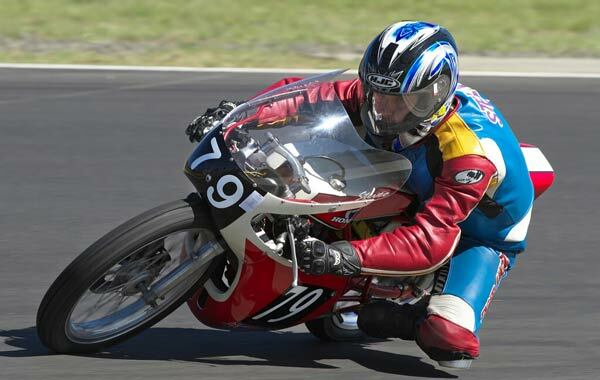 Steve Kairl hustles the little Honda MTR to good effect winning all 4 heats in the 125cc Forgotten Era. 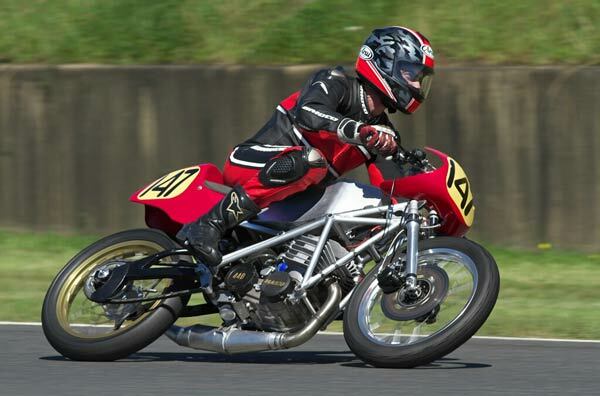 Not your average bucket racer but lets see, Norton featherbed frame, roadster es-2 engine highly modified, various bits and pieces looks like a very expensive dare I say it bucket racer. Quick too, rider Chris Swallow won every time out. 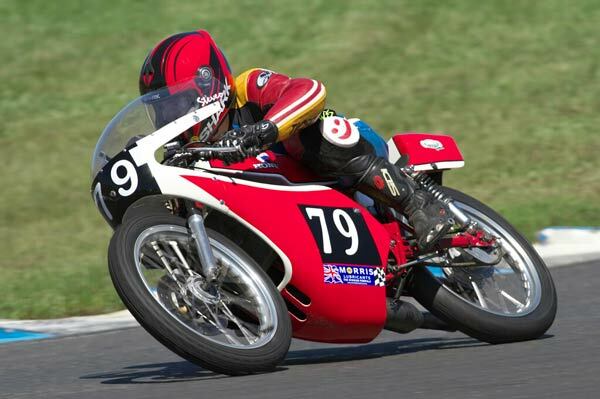 Greg Delsanto's interesting space framed 440 Maico finished 3rd in the The Forgotten Era 500cc Class.